One of my most asked questions is: "How did you get into blogging?" Before I get into my story, I just want to apologize for taking so long to share it. To be perfectly honest, I don't like to refer to myself as a "blogger" (mostly because I don't write on my actual blog enough to qualify as one), and I wasn't sure my story was one to follow when blogging is such a small part of what I do. I'm also not a blogger with followers in the millions, so in the past I sort of felt reluctant to share, as I wasn't as influential in comparison to others. Blogging is not something that I thought I ever COULD do, mostly because I didn't believe in myself or in my abilities to start in the beginning. Contrary to a lot of very interesting comments and messages I receive on social media, I am not rich, I DO wear the same thing more than once, and my parents do not pay my way, for my apartment or my travel expenses. Now that it's been about three years since I started, I figured - better late than never. Prior to all of this, I used to scroll through Tumblr to get my daily dose of "blogger life" inspo, but I didn't have the camera equipment, the copious amounts of designer clothing or the technological knowledge to try it for myself. In 2014, my impression of a blogger - or "influencer" as everyone seems to call it these days - was someone who had the money, time, and skill for it. At that point in my life, I was a recent college graduate working a 9 to 5 desk job and trying to afford the ridiculously expensive rent & food costs in Southern California. I had gone to school to study and research neurological disorders, but after four years of university and 13 years of school before that, I was burnt out and decided to get some real work experience instead of continuing my education. I worked in fashion retail and for the information technology department on campus while I was in college, so I was able to land my first job outside of school at a small online fashion retailer in Orange County. If you've worked at a small company before, then you probably know that you take on a lot of different tasks (some that are definitely not in your job description). However, working at a small company allowed me to learn a lot of the things that I honestly cherish as an influencer today: how to properly write an e-mail, how to use Photoshop and Illustrator, and how to appeal to an online audience. I owe a lot to my first job, but after two years, I felt miserable. Restless. Uninspired. Stuck. I was bored doing the same things that I did every day. I wanted a change, and at the time, I thought it was the company I was working for that was holding me back. After talking about it with my then-boyfriend (now husband), we decided to uproot our life in California and move to Texas so that I could pursue another job in a whole new state where no one knew who I was. It didn't take me more than a month to realize it wasn't the company I worked for that was making me unhappy. It was me. I realized that I just didn't like working in a corporate setting, and I was tired of having my creative input being taken and applauded as a "company effort" rather than something that I came up with on my own (as selfish as that sounds). I didn't know what to do. I didn't want to go back to school, I couldn't quit my job, and I had literally JUST moved to a whole new state. I couldn't just go back home. I decided I needed a hobby. Something to take my mind off of work. Sure, I had hobbies before - thrifting, exercising, hanging with friends - but those activities didn't feel like I was doing anything productive. I wanted something that wouldn't make me feel empty the moment it was finished. Enter: Instagram. I didn't start my Instagram with the intention of becoming an online influencer, as you can see from my first post. I opened my account in 2012 and all I used it for was to share photos with family and friends. I kept up with it over time, but it was mostly phone selfies, pictures of my dog, and what I ate at that restaurant that one time. I saw that a lot of big accounts/bloggers would use their Instagram to post their outfits, so I started to do that as well. I didn't wear designer anything, but I did love to look for outfit inspiration and then thrift my outfits based on trends/my own personal style. Say what you want about social media, but it was fun to see strangers liking and commenting feedback on my outfit photos. I even started to make friends with other women - like me - doing the same thing. By the time I was fed up with my job in Texas in 2014, my husband would help me take iPhone photos of my outfits to put on my Instagram. Sure it sounded silly at the time, but it was the only thing keeping me together. It was something fun to do. Something that wasn't about how serious life gets once you've finished school and have to join the real world. At the end of 2014, I had gotten my first e-mail from a brand asking me how much I charged to promote their product. My first reaction was, "Wait, what?" I'm not going to lie - I cringe when I watch this. The camera we used was the first DSLR I had ever touched in my life (my Canon Rebel T5 with the 18-55mm kit lens), and I had no idea how to use it. My personal style was very 90's grunge at the start of 2015, so my husband just filmed little clips of me wearing outfits that I had styled with the many flannel shirts I owned. I had no idea what I was doing, but I was determined to make a video out of it. I stayed up the entire weekend trying to piece the footage together in iMovie (on a MacBook that I had saved up for since college), and by the time I was finished, I posted my first video to YouTube. It got about 20 views after a week. Probably all from my mom. I didn't care about the views, though. I had never done anything like that for myself. It was liberating to put out something I had created online for anyone to see and judge. From that moment, I was addicted. I continued to post every day on Instagram and 1-2 videos a week on my YouTube. Yes, I was still unhappy at my job, but I couldn't wait to get home and take/edit photos/videos with my husband. My life had been so serious for so long - life felt exciting again. I was very consistent with my content (to this day, I don't think I've gone a day without posting something somewhere), and it didn't take long for people to notice. My co-workers found out, a local publication reached out to do a story on me, and photographers started to message me asking if I wanted to shoot with them. I was at a party when I got an e-mail and DM from Instagram saying that I had become a suggested user. I had no idea what that meant, but it didn't take long for me to find out. I had less than 2K followers when I was featured on Instagram's suggested user list in April of 2015, and 24 hours later, my follower account had hit 10K. By the end of my time on the suggested user list (which was about 2 weeks), I was at 40K and everything happened really fast. First of all, I started to lose followers right away - like thousands a day. It's very common for people that get featured on Instagram's suggested user list to lose a large portion of the followers and engagement that they received after the feature is over, but I was determined to keep it. My follower count leveled off at 30K, but I didn't let that deter me. I was posting around 3 times a day after that, and it wasn't long before I stopped losing followers and started gaining them again. Second, it opened up a lot of doors. With all the exposure I had gotten, bigger brands began to e-mail me for sponsorships and collaborations, and I was so stoked that I didn't want it to stop. By the time my apartment lease was over in Texas at the end of 2015, my husband and I decided to go back home to California. We didn't like living in Texas, our families were in California, and if I wanted to pursue content creating full time, I had to make time for it. We quit our jobs in Texas, and moved into my husband's parents' house until we could get settled and find our own place. Since we did all of our own photography, videography, editing and graphic design, I put all of our work together in a portfolio (in addition to projects I did for my 9 to 5 jobs), and started to do freelance photography, graphic design, and other content-based projects - in addition to sponsored posts on my Instagram. A couple months after that, I started my blog since I had so many extra photos that I ended up not posting to Instagram. Once we were settled back in California, I started posting YouTube videos again at the beginning of 2016 (after taking a little break after our move) and have continued to do all of this up to this day. I slowly branched out from fashion to include posts about my lifestyle, travels, diet, relationship - everything. At this moment in time, I have around 123K followers on Instagram, about 70K subscribers on YouTube, and a fluctuating amount of views on my blog depending on how often I post. My story is one of consistency - I've never given up, and I won't as long as I enjoy doing it. Like I said, say what you want about social media, but it's brought me so much joy and so many opportunities that I never thought were possible. 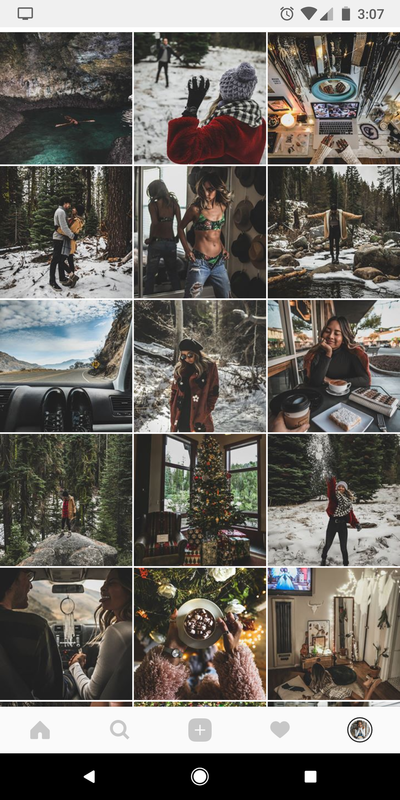 I've been able to create content for huge brands that I've used since I was little, meet all kinds of creative & kind people online/in-person, travel the world, and afford a comfortable life where I can spend as much time as I want to with the love of my life. I still don't think of myself as a blogger, or even an influencer, really. I like to think of myself as a content creator. Out of all the things that I've done to get to where I am now, being able to create for a living is what I'm the most proud of. If you've read up to this point, I hope this answers your question and that it gives you inspiration to pursue what makes you happy. That's all I've ever wanted to do.